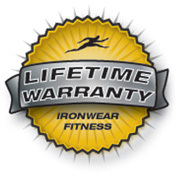 VR8 Vest Rack™ is IRONWEAR’s™ new patented storage system for your weighted vests, extra weights and other weighted gear. VR8 Vest Rack™ was invented for group training of: police, firefighters, military, clubs, and sports teams where multiple weighted vests were utilized. VR8 Vest Rack™ has 8 support tubes designed to hold any combination of short or long Club Vests™, Speed Vests™ and/or Cool Vests™. The support tubes are spaced wide enough to hold single or double loaded weight vests from 1 to 80 pounds each. VR8 Vest Rack™ has a steel wire storage shelf with a raised edge to keep thing from falling out. You can use the shelf to store all your extra Flex-Metal™ weight inserts or store your Shoe Irons™, Hand Irons™ and /or Ankle Irons™. VR8 Vest Rack™ comes with heavy-duty wheels so you can move your weighted vests easily from place to place. 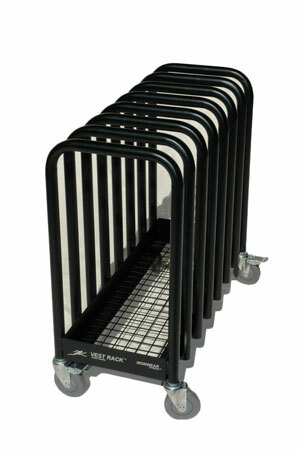 After rolling the rack into position you can lock it in place with the wheel locks. Roll your vests easily from room to room, roll the to the practice field, and roll them into a corner or closet to store them. VR8 Vest Rack™ makes life easier for everyone. Weighted vests can be a major problem. Users tend to leave the vests piled up on the dirty floor, creating an immovable mass. 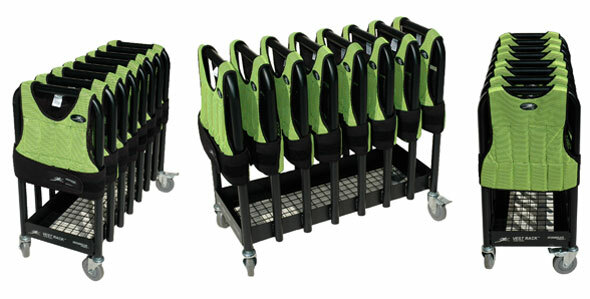 With the VR8 Vest Rack™ users can easily slide their vest on and off the rack. This helps to keep the vests and your floors clean. VR8 Vest Rack™ makes it easy to check you inventory and helps to keep vests from disappearing. With a glance you and/or the users can see that all the vests are in place. The user can also quickly pick out the vest they want to use and with the storage shelf, they have somewhere to get or place extra weights. VR8 Vest Rack™ open design allows air to flow on the inside and outside of the vests. This help to keep the vests fresh and ready to use. 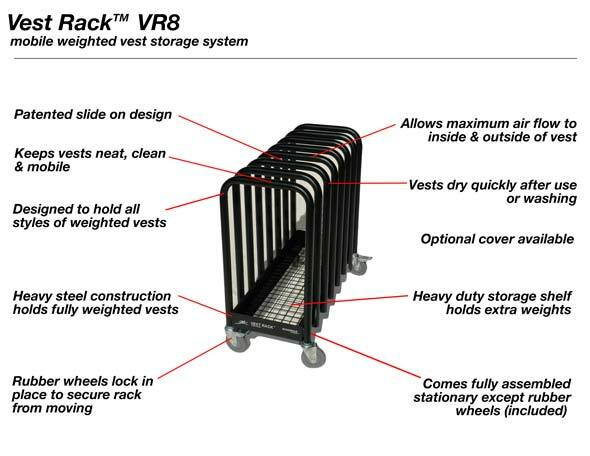 VR8 Vest Rack™ is easier and safer to use. The low profile slide over design minimizes the lifting required. Before the VR8 Vest Rack™ users tried to put their weighted vests on hangers, this proved to be a very difficult operation, hangers and closet rods failed since they were not strong enough to support the vest weight. VR8 Vest Rack™ supports the vests securely on three sides. Just attach the straps to the front of the vest and slide the vest over the support tube. Removing the vest is easy too.